Tulsa needs more…..shops, restaurants, small biz, local support, etc. Tulsans need a better attitude. Quit going to Chili’s. Quit going to that crappy street known as “restaurant row”. You know what I’m talking about. There is nothing there. Well, there is something there, but it’s taking money out of the state. Downtown is on a roll. A slow roll, but a roll nonetheless. They’re heading in the right direction, but more needs to pop up besides the often inaccessible and time consuming routes of construction that detours our day. Someday, that’ll be all gone…..I hope. Brookside and Cherry Street are always blossoming with great food ideas, but even the fickle people of Tulsa can’t support it all the time. It boggles my mind that a place like The Brasserie is closing soon. It’s scrambles my brain that people I talk to still have never heard of Fat Guys Burger Bar. Something needs to change about that! What makes a good restaurant? Or better yet, what makes a brilliant food idea? Diversity! Diversity is key. Food Trucks is the answer. Hmmmm, maybe not THE answer, but it’s still a great idea. I’m not talking about a “roach coach” either, but an actual food truck with a full kitchen where food is made to order. A restaurant on wheels. Mobile. Efficient. Diverse. I mean, why not? A food truck could definitely make it here. Sure, the roads need work, but let the “restaurant” come to you. I’ve been even seeing some restaurants in other city’s even branch out with food trucks to get to more advocates of their fine foods for a reasonably better price. Go South! Go North! Go West! Go East! 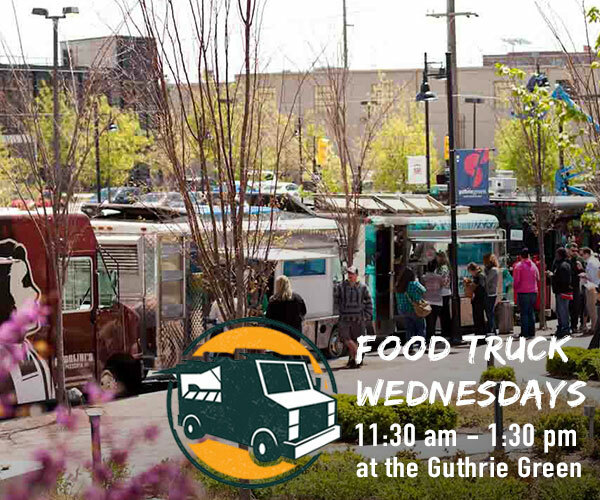 Somebody needs to jump on this idea besides the one food truck we have here in Tulsa. Ok, we have more than one, but they’re not very mobile and hardly ever heard of. As much as it pains me to say it, they need Facebook so the people of Tulsa can follow. They need to embrace with the times. On my travels the past few weeks I’ve eaten at some great places. A food truck was definitely a standout though. East and West coast have great food truck ideas. And a few spots in the middle as well. 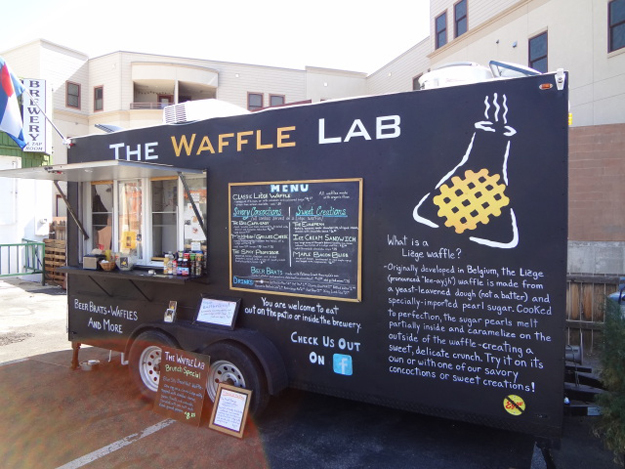 Like “The Waffle Lab” in Ft. Collins, Colorado. They don’t move much, so they’re easy to find….during the week at New Belgium Brewing Co. and weekends at Pateros Brewing Co. Waffles!? Really? First off, these are no ordinary waffles. They’re liége waffles. A Belgian style waffle that’s more a dough than a batter with sugar pearls. When cooked, the pearls melt right in the dough for a sweet and crunchy bite. What can you do with a waffle besides throw some syrup on it though? Well, Bill Almquist, the creator of this awesome meals-on-wheels idea, has the answer. Actually, he has many answers as you can see on the menu. Breakfast waffles, savory waffles, dessert waffles, chicken and waffles, beer brats and waffles….and the list goes on. As I saw this, I went up and talked with Bill. Great guy with a genius idea. I vowed to come back the next morning for breakfast. And we did just that. 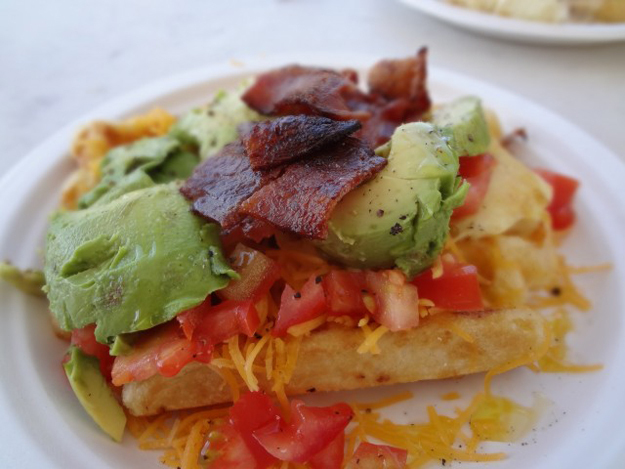 I had the Blue Sky Breakfast Waffle…cheddar, egg, tomato, avocado, and bacon on top this wonderful liége waffle. Sprinkled with a little sea salt and pepper. Amazing combination. The wifey had the liége waffle with scratch-made sausage gravy and fried egg on the side. Thinner than a traditionally, thick, biscuits-and-gravy gravy so it can get in all those spots in the waffle and let it soak. 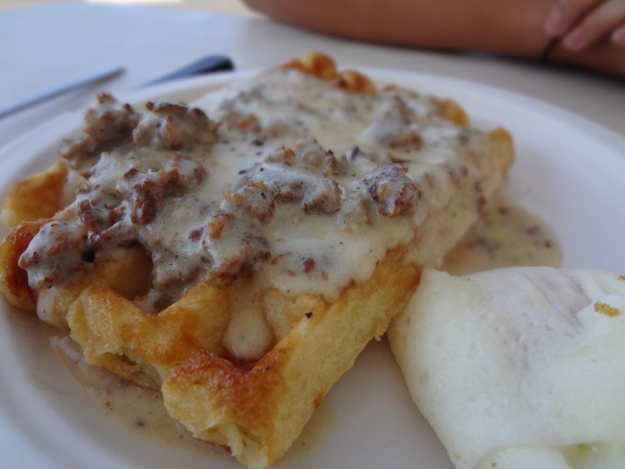 An excellent, sweet crunch with every bite of the waffle and the flavorful, sausage gravy added a great, salty balance that was just….well, without words. It was surprising and delicious. Such a simple idea that was executed perfectly….and I’m not just talking about this particular dish. It’s easy, but you have to venture out like Bill. He thought outside the box and voila! But, he’s in another state. Too bad that truck isn’t here. I looks forward to visits to Ft Collins as usual. But, exciting news, and behind the times like Tulsa often is….The first annual food truck festival is going to be Sept 29-30 at the Tulsa air and space museum! I’m so stoked!! And I will definitely be going to check out what is offered. Will you?